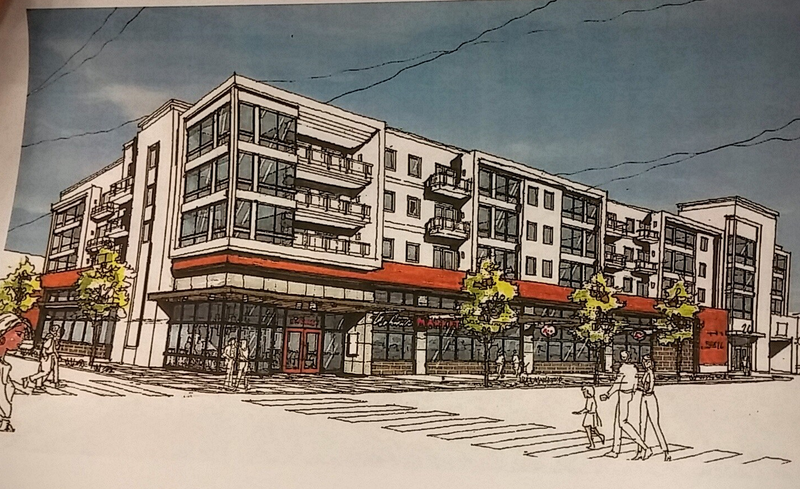 Master Properties is proposing to build 76 apartments and a grocery store at 2601 Lyndale, in the space currently occupied by a vacant lot and four houses. At last night’s meeting of the Whittier Alliance neighborhood association, developer Don Gerberding said he has an agreement in place for all six parcels, and he plans to complete the purchase by the end of February. When asked, he indicated the development proposal was not contingent on the involvement of the specific retailer currently attached to the project. Unit types would include studios, one- and two-bedrooms, with sizes ranging from 500 to 1200 square feet. 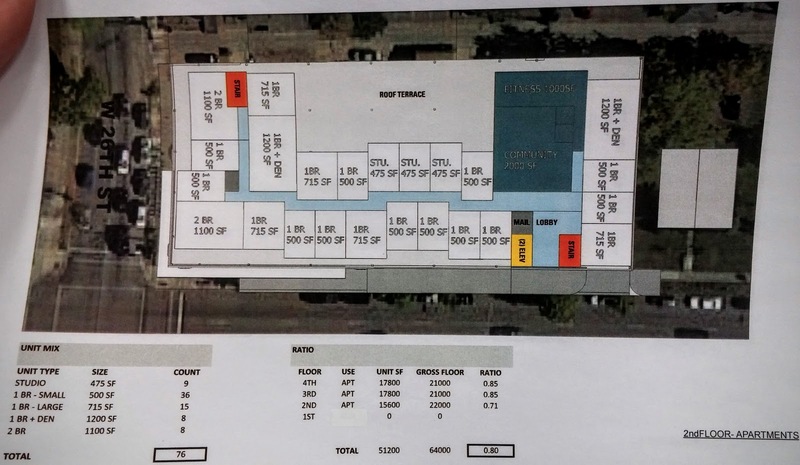 The building would have four stories, a grocery store at street level, fitness and party rooms, a rooftop terrace, and two levels of underground parking totaling around 160 stalls (60 spots allocated to Aldi, 26 for the French Meadow restaurant across the street, and the rest for residents). Renderings show the parking entrance at the south side of the building, off Lyndale Avenue. Gerberding said rents would go for around $2 per square foot. Recent Streetview of the corner. Gerberding somewhat hilariously tried (or pretended to try) to conceal the identity of the grocery store under a thin layer of white-out. Criticism of the project was largely focused on the fact that it would house a “corporate” chain, rather than an independent local store. Some pushed the idea that “the neighborhood” is united against any incursion by a national chain. Maybe this is in some document outlining the core principles of the Whittier Alliance, but that’s not the same thing as representing a substantial portion of the neighborhood. The inflexible attitude came off as unbearably snobbish, especially when talking about Aldi, a grocery store famous for steep discounts. While Whittier is home to the Wedge Co-op, the majority of residents who shop elsewhere would be better served by some retail diversity. There are plenty of people in Whittier and surrounding neighborhoods for whom affordable food closer to home is a pretty welcome amenity. Some attendees expressed a desire for more three-bedroom units, as a means of providing affordable options for families. To emphasize her preference for larger units, Whittier Alliance President Erica Christ said, “I don’t think anyone in Whittier has a hard time finding a one-bedroom.” The 20-something renter seated next to her quietly let her know that, actually he’d had just that problem. Christ also mentioned her desire to move the four houses rather than demolish them, while Gerberding was skeptical about the houses being worthy of salvage. The building would be named “Rex 26” in a tribute to the hardware store that stood on the corner for nearly 100 years. Gerberding said he plans to come back to the neighborhood in February with a more “formal” proposal.